It was the middle of the night on Pulau Babi Hujong. The air was humid and still, as you would expect from an island near the equator in the South China Sea. “What son, sleeping outside is bagus!” That means ‘good’ in Bahasa Melayu. It was a 3-foot long monitor lizard that had come down from the jungle brush of the island in the middle of the night. Adventures such as that were common with my dad. I was born in the United States, but was being raised in Asia as a TCK by a single parent. How did that happen? My brother and I were living our lives in the American Midwest with mom and dad. Suddenly, my parents split and divorced. I was 7 and my brother was 5; we both have vague memories of them together. Dad had custody of me and mom had custody of my brother. Shortly thereafter my dad, who worked as a businessman and operations manager for a glass company, and I moved to Singapore, which became home. I realize that being raised by dad in Asia is an “out of sync” and unique experience. From scuba diving in Malaysia to eating at the stalls in Singapore, our adventures together defined much of who each of us are, and we both are grateful for it. My dad was very purposeful, always encouraging my self-confidence and his time with me was a priority to him. He knew it was not the ideal situation for me growing up apart from my mom and brother, and it was certainly not the plan. Now as a single dad myself, I can see life has a way of bringing sunrises and clear skies after typhoons. The best analogy I can draw in becoming a single dad was that it was an unexpected, blindsiding typhoon ocean wave; certainly was not foreseen. I was married for nearly seventeen years, and during the transition, I recalled and reflected on a something my Dad shared with me that was hanging on one of the living room walls in our Singapore home. It was a scenic painting of large rock surrounded by a rugged coastline being battered by ocean waves. Think of the coastlines of Hawaii, the British Isles, or parts of California along the Pacific Coast Highway. I remember asking dad what it spoke of to him. He said that though the ocean waves keep pounding the rock and coastline, through it all, the rock just stays there and holds it ground. Through the chaos all around, it represented strength and resilience to carry on. That is what I had to do for myself and my kids. Though I do not look it, Asia runs through my veins. My “Sweet Home Alabama” is “Majulah Singapura.” I go back to Asia in my mind often – it’s hard not to when cultural exposure as a child shapes who you are. Even now, fast food to me is satay, roti, laksa, curry, with a fresh lime. For dessert? Ice kacang. From being raised by a single dad, to one now, I’ve learned the importance of spending time together. 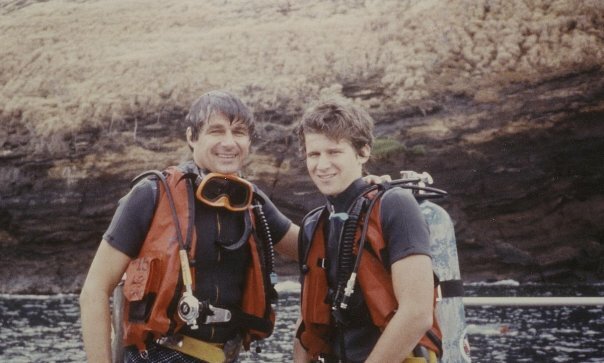 Dad would often say, “can’t have quality time without quantity time.” We both are scuba divers, and were dive buddies often in the South China Sea. During many of those dives we would swim ashore to an island, take off our gear, get out our dive knives out of the sheath and use them to get through coconut husks. That is one of the ways we spent time together, and certainly ate our share. As I navigated the transition to becoming a single parent, I came to appreciate the traits developed as a TCK. Rather than running in search of who I was, I came to the point of embracing it. As my dad had modeled for me at a young age, I had to be resourceful and adapt to my new environment quickly. This adaptability helped form a sense of adventure that I could not live without, always up for it anytime, anywhere. I have seen Mt. Everest with my own eyes, gone night diving in the South China Sea, wandered the jungle countryside of Malaysia and Indonesia, seen elephants as a matter of course in Sri Lanka, had a ‘move slow and stare’ contest with a Komodo dragon. Nowadays with my ‘tiga’ (three), it can be our Asian dinner nights, parasailing while looking for miles across the Atlantic Ocean, or going on zip lines over quarries. Come to think of it, what qualifications did my dad have with me, or me with my three, in becoming parents in the first place? The skills I learned from my dad, and from being a TCK, translates well to being a single parent. My kids have learned that change happens in life and it is important to be adaptable, flexible, and confident with change as it provides a sharpened perspective. Value relationships yet be self-reliant. Understand that transitions can be tough, relate and empathize and know how to put closure to one phase and move on to a new one. Finally, have the tough mindedness and ability to not just survive change, but also thrive from it. The fact is that there are no ordinary lives, we all have experiences, relationships, lessons, and adventures of their own. I embrace being a TCK and “at home” with who I am, and that certainly holds true now as a single parent. Though my upbringing may seem imperfect and “out of sync” with others, it sure fits perfectly. Leaving the American Midwest and all that was familiar as a child when he was nine, and raised by a single Dad in Asia, Ed Deiss embarked on an unexpected journey. He is now on another one as a single Dad himself of three wonderful children, Will, Rachel, and Zoe. He has the unique background of being raised by a single parent, in Singapore, as a Third Culture Kid (TCK). Through that time, he always knew he had a connection to his mom and brother even though in different worlds; relationships now restored. The parallels and perspectives gained have served him well in adjusting to and being a single parent. He started the coconut husk on Father’s Day 2012 to encourage other single Dads, kids of single parents, and Third Culture Kids (TCKs). He is now quite at home with his kids and he and his family reside in Mechanicsville, VA. Ed understands the challenges and sacrifices that single parents face daily and is part of a team of parent bloggers at Single Parents Town which was created to support single parents as they face the challenges, fears, and joys ahead; inspire and motivate them to be excellent role models for their children, and; to provide a source of services, advice, and resources to help organize and balance their life. You can also find him LinkedIn and follow him on Twitter.